When is it time to start cleaning my baby’s teeth? As soon as you see one! 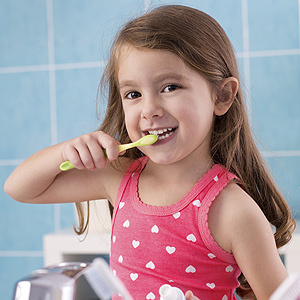 The earlier your child gets used to a daily dental hygiene routine, the better. Baby teeth that have not fully emerged from beneath the gums can be wiped with a clean, moist washcloth after feedings. A tooth that has grown in completely should be brushed twice daily (once in the morning and once in the evening) with a soft, child-sized tooth brush and a thin smear of fluoride toothpaste. Fluoride is an important weapon against tooth decay, but you don’t want your child to swallow too much. Absolutely — especially if they are allowed to fall asleep routinely with a bottle filled with anything but water. Milk, formula — even breast milk — all contain sugars that should not be left to pool around your baby’s teeth during sleep, facilitating decay. Juice is an even bigger no-no because it is not only sugary but also acidic. Can’t I give my child sweets once in a while? We realize total avoidance of sweets may not be realistic, as beneficial as this would be for your child’s teeth. If you are going to allow your child to have sweets once in a while, better that the treat be given immediately following a meal, and not as a between-meal snack. Soda should really be avoided completely — it’s that bad. The experts say: Get it done in year one. That’s right — even though your child won’t have many teeth by age 1, there’s a lot we can do at that first visit to ensure good oral health now and well into the future. We will do everything possible to make sure your little one has a positive first experience in the dental chair; this helps set the tone for the many important preventive visits yet to come. It’s also a great opportunity for you to ask any specific questions you may have, and receive hands-on instruction on how to care for your child’s teeth and gums.